You recently borrowed a G.B. Ceruti (1801) and a Giovanni Grancino (1685) violin from us to use in a recording session. How did the two instruments compare? I was recording several commercial tracks for We Write Music Ltd, for different types of clients. 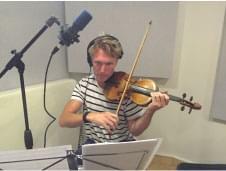 In the end we decided to use both violins for orchestral and solo lines of recording and, as is usually the case with commercial recording, a lot of the decisions were made in post production. Interestingly, the rather ‘nutty’ and gravelly sound of the Grancino worked extremely well in the classical-style pieces, and the more modern Ceruti had a directness and clarity suited to the neo-romantic tracks. Intriguingly, this also reflects the historical time periods in which the instruments were made. You’re well known for your sight reading ability. Do you need to spend much time with a violin for its character to open up to you, or do you respond quite quickly to its personality and capabilities? I’ve been working in the recording industry since I was seventeen years old and have always been told that my sight reading ability is exceptional but that my playing doesn’t improve much after my first attempt! I do however have the flexibility of technique to pick up instruments and play them immediately. Often in concert. I played the Franz Waxman Carmen Fantasie with an orchestra on a violin which I’d had for only one day and felt at home. The better the instrument, the easier the acclimatisation, of course. I estimate that I’ve played on well over fifty violins in the last two years. We often ask you to play instruments in for us. A good player can really make useful recommendations on how to improve an instrument’s sound. A week of intense playing can really transform an instrument’s clarity and responsiveness. There’s an element of trust required on the part of the player, though. On an unfamiliar instrument, you have to have the confidence to go ‘all out’ and perform to the best of your ability. You have to trust that the notes will all be there. 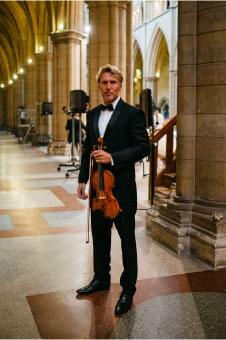 You also played the Ceruti in a world premiere of a piece at Truro cathedral. How did it go? Did the violin suit the music and stand up well in that unique acoustic? The world premiere was of Paul Drayton’s The Passion of Christ [As Told by Mark The Evangelist] with the cathedral’s Three Spires Singers and Orchestra. There are a notable number of violin solos in the piece which is one of the reasons I was so keen to perform it. The powerful and clear tone of the Ceruti suited the acoustic of the cathedral perfectly. The choir and orchestra also performed excellently and the whole experience was an absolute pleasure. You have also played a 1742 G.B. Guadagnini in a concert at the Hall For Cornwall. What pieced did you play and what did the Guad bring to the party? The Guadagnini was really incredible. In a dry acoustic like the Hall For Cornwall you have to have an exceptional instrument to make any impact at all. When it came to the solo, I had what I would call an almost out of body experience as it was such a truly incredible sound. The piece was called Lost Lake by Oliver Davis who is, incidentally, the son of Howard Davis (Alberni Quartet) who taught me from the age of 11. Oliver and I have collaborated many times and it was great to have him in the audience. There was even a piece on regional BBC TV highlighting the visit of a truly remarkable violin to Truro for Valentine’s day. Interestingly I’m going to be performing the piece again at the end of July in Cornwall with the addition of a group of cliff dancers who have devised choreography for the piece. I can’t wait to see what is going to happen! Well, I probably won’t see it but I hope that someone will record it for posterity. Do you have a favourite out of all these violins, or is it horses for courses? Each of these instruments has brought its own unique colour to my recording life. If I had to summarise: the Grancino is a great all-rounder, and the Ceruti is perfect for solos and carries well across a full orchestra. The Guad is an experience. Period. You are as passionate about strings as we are. Has it always been that way? I have loved everything about the violin from the age of five. During my years working with London orchestras I have used my persuasive nature… I would approach the soloists we were touring with and ask to borrow their instruments for the second half of the concerts. After all, they were done by the interval and were only waiting in their dressing rooms for the end! In that way I managed to borrow Isaac Stern’s Guarneri from Boris Belkin, Gil Shaham’s 1699 Strad, Nikolaj Znaider’s Guarneri and countless others. It was a real experience for me, and I think the soloists just couldn’t believe my cheek! Beethoven 5 was great on Gil Shaham’s violin and the only downer was that, in return, he wanted to be my desk partner on my own violin when the original player had gone off sick. Management refused him. Shame! And finally, what’s on your bucket list of future things you’d like to try? My bucket list is a bit weird because I really love the review Henle gave a French maker called Savary [see below]. I’ve played on violins by most of the greatest luthiers in the world, so isn’t it logical to want to play on one of the worst? !